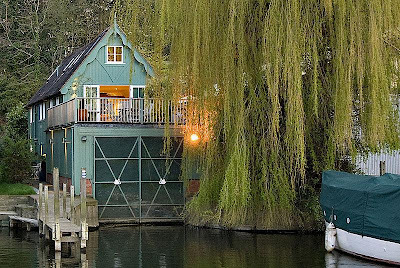 This boathouse on the Thames at Cookham Dean is on the market and I want it. Most of what must have been boat storage behind has been converted into a three bedroom house with a huge living room opening onto a terrace above the wet dock. The price is a bit of a problem, though. If any eccentric billionaires are reading this, I could do with a small non-returnable loan of a million sovs to buy the place. Oh, and I also need to buy the restored Andrews slipper launch that is available 'by separate negotiation'. The agents are Friend & Falcke in Chelsea on 020 7581 3022.